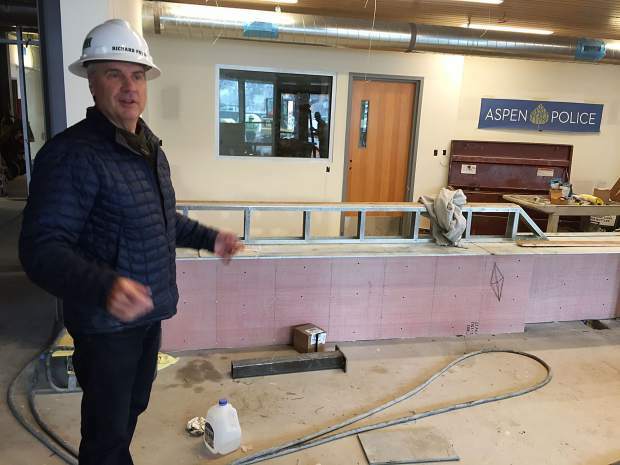 Aspen Police Chief Richard Pryor shows off the new reception desk and area inside the department's new $20.9 million building on Main Street. After nearly a year and a half of preparation and construction, the Aspen Police Department’s new home is almost finished. 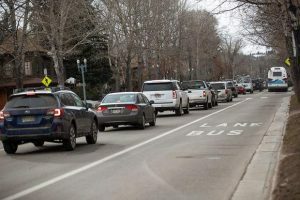 “We expect it to be operational before the end of June,” Aspen Police Chief Richard Pryor said Friday. The new, 18,515-square-foot building at 540 E. Main St. will allow the department to escape its cramped quarters in the basement of the Pitkin County Courthouse, where it’s been since the 1980s, Pryor said. Prior to that, city police were located inside City Hall. Construction workers began the $20.9 million project in November 2016 by tearing down a 1970s-era ranch house on the site that used to house the city’s Parking Department. In the interim year and five months, the building — located next to Pitkin County’s new administration and public safety building that is also under construction — the new Police Department has taken shape. On Friday, Pryor showed a reporter around the spacious new building as construction workers continued to apply the finishing touches. About one-third of the building will be available to the community to use for public meetings, events or just to climb the stairs to the new south-facing patio overlooking Main Street and Aspen Mountain to eat lunch, he said. Police officials haven’t yet determined exactly how that public side of the building will be managed, he said. However, the public space will include most of the front portion of the building, Pryor said. The rest of the building includes many amenities missing from the department’s current setup, which generally includes a lack of space. In fact, the department rents office space at the Obermeyer building for detectives and for Pryor himself to be able to have an office. 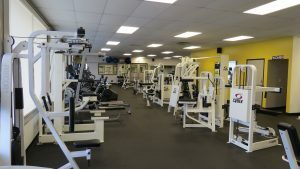 Those amenities include several interview and conference rooms, a ventilated gun-cleaning and maintenance room and a locker room and gym area for officers. The department’s 28 officers and five community resource officers will be centered in a large operations room on the first floor, along with a sizable break room and kitchen area, as well. The large, basement-level garage will hold all department vehicles, radar trailers and bikes, as well as a large new evidence-processing and storage room. The second floor will house offices for Pryor and his two assistant chiefs and the department’s two detectives, as well as including a room for mothers to breastfeed babies, a room with a window to supervise juveniles and another interview room for crime suspects. The new building also will have two connecting doors to the new Pitkin County Sheriff’s Offices next door. Also included in the project is an 8,290-square foot affordable-housing building that will feature three one-bedroom units, three two-bedroom units and two three-bedroom units. The $7.3 million complex is located behind the new police building and will house both police officers and city employees.